In honor of our inclusion giveaway, we’re going to continue today’s post with some insights from one of the books featured in the gift box: The Educator’s Handbook for Inclusive School Practices, coauthored by Julie Causton & Chelsea P. Tracy-Bronson. What does meaningful inclusion really look like? 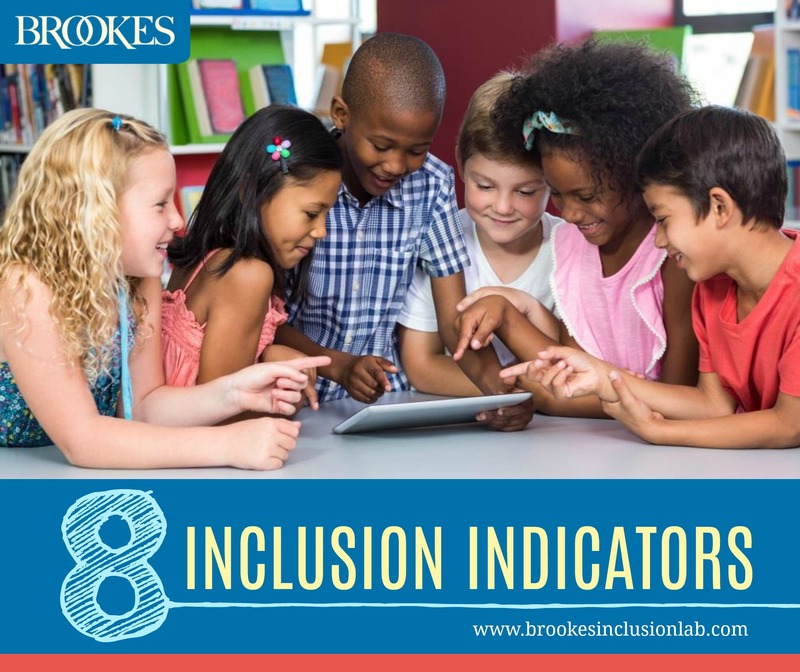 In the book The Educator’s Handbook for Inclusive School Practices, Causton & Tracy-Bronson identify eight key indicators of inclusive classrooms. This isn’t an exhaustive list–just some of the main features you might expect to see in a classroom that welcomes and includes all students. How many of these indicators do you see already in your school? Which ones would you like to focus on in the new year? Special and general educators work together. Co-teaching–also known as team teaching or collaborative teaching–is a primary indicator of inclusion. Two teachers, one general and one special education teacher, share responsibilities for educating all the students in the classroom and collaborate in flexible, coordinated ways. The team of educators will often co-teach or teach small groups, with the understanding that no group of students is the sole responsibility of one teacher. It’s important to note that not all inclusive classrooms have two teachers physically present. In some classrooms, the general education teacher will use modifications and adaptations designed by a special educator, or the general ed teacher will collaborate with a paraprofessional. Co-planning time is built in. In inclusive classrooms, general and special educators establish a weekly time when they can sit down together and plan, brainstorm, and design their upcoming units and lessons. The teacher team also implements a good communication system so they can discuss the specifics of lessons and any individual student needs and issues that come up. The team also ensures that any related service providers are kept in the planning loop, so they can integrate therapy skills seamlessly throughout the day. Community building is a priority. Community building is a great way to show that diversity and disability are embraced and ensure that students feel connected to one another and to their teachers. To build community, teachers in inclusive classrooms emphasize that different people learn in different ways–and develop activities that help students learn more about each other. Causton and Tracy-Bronson suggest a community-building exercise called “Homework in a Bag,” in which each student brings one item that represents them and shares the item with a small group of other students. Teachers might also start their morning meetings by asking each student to share something with the class. Student population reflects natural proportions. Natural proportions are an important feature of inclusive education. If there’s a disproportionately high number of students with disabilities assigned to a single classroom, the needs of this group of students will be greater, and this will make the class resemble a special education setting instead of an inclusive classroom. Differentiation is a hallmark of inclusive education. Learners with diverse needs might be working on similar goals in an inclusive classroom, but they’re working toward their goals in different ways. In a math class, for instance, all the students might be working to solve problems, but some could be using manipulatives, some could be drawing their work, some could be checking their work on calculators, and some could be using wipe-off markers and whiteboards. General and special educators should work together to design and implement meaningful differentiation for students of various academic, social, and behavioral levels and needs. Students don’t leave to learn. Inclusive classrooms welcome all students as full-time members of the general education classroom. Special ed services happen right there in the classroom, so that students aren’t pulled out for specialized instruction. For example, instead of a student going to a separate therapy room to work with sensory materials, their occupational therapist could set up a sensory “toolbox” for use during English or math class. Teachers in inclusive classrooms look for ways to modify and adapt lesson materials to ensure that students are not removed from the classroom for instruction. Grouping and seating are heterogeneous. Inclusive classrooms don’t cluster students with disabilities in one area of the room. Instead, students with disabilities are physically spread out in the classroom, and their locker locations are also naturally distributed. Small groups are heterogeneous–students are not grouped by ability or any other defining factor. This helps ensure that students learn from each other and respect each other’s diverse abilities and backgrounds. Instruction is engaging and exciting. Teachers in inclusive classrooms don’t do a lot of lecturing while students passively listen. Teaching and learning are engaging, exciting, and accommodating for all students. Active learning is the rule of thumb, and students are often moving around, working with partners and groups, and touching and interacting with learning materials. Lessons incorporate multiple sensory modalities, so there are many different entry points for different kinds of learners. Dynamic teaching helps every child–with and without disabilities–learn academic content and make progress toward their goals. What defining features of inclusion would you add to this list? Which ones do you want to strengthen in your classroom? Tell us in the comments below!